The AV department has three Toshiba 42 inch LCD TVs. 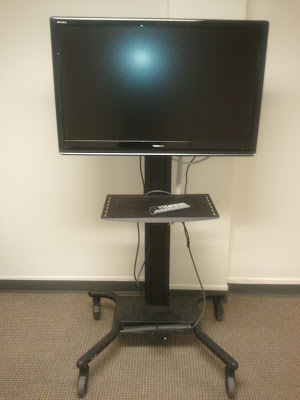 Each TV comes on its own rolling stand or cart, has 4 HDMI inputs, 2 composite inputs (yellow, red, white cable), 2 component video inputs (red, green, blue video cable with red and white audio cable) and 1 VGA input (computer cable). This TV is perfect for small meetings and presentations. A power strip with 8 slots is also included.